Recently we visited the historic garden ‘Culzean’ (pronounced Cullane) in Westbury, Central North Tasmania, around 70km from the coastal town of Devonport and 35km from Launceston. An autumnal canopy of Golden Ash Fraxinusexcelsior and a Lime tree, Tilia x europaea shade the box-lined driveway which draws us into the property. The property is owned by Phillip Leith and Dinah Fitzgerald who bought it in 2012 – and began to contemplate the legacy. The thirteen-hectare property, now including nearly three hectares of gardens, a dam and a lake, has been cherished by several owners. 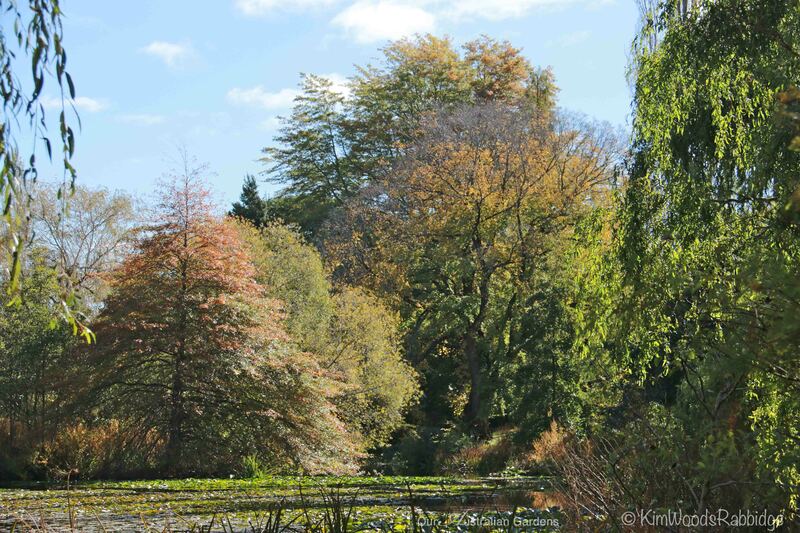 the lake is bordered by swamp cypress Taxodium distichum, dawn redwood Metasequoia glyptostroboides, and many deciduous beauties. In 1841 Captain Edward Martin, an officer in the Indian Army, bought the property and built ‘Woodbine Cottage’. Many of the significant trees, including along the driveway, were planted in the late1870s during the two short years a Mrs Joy owned ‘Blair Athol’ (as the property was then known). When a later owner, Charles Allen MLC, moved in he changed the name again to ‘Leicesterville’ – in deference to the English Leicester sheep he bred. Three decades later, in 1907, Mr and Mrs Charles Busby, from northern NSW, renamed the property ‘Culzean’, and lived here for fifty years. Apparently an employee (whom they must have admired) had worked as a game-keeper on Scotland’s Culzean Castle Estate. As Mr Busby is buried here it’s now a registered gravesite. The 1840’s home sits snugly in the landscape. In 1965 Dr and Mrs Laker became the owners and their tenure was significant. Dr Laker, a vet with a passion for gardening, built the lake and planted many of the conifers. The garden was open to the public and he ran a nursery. There’s still some evidence today: trees planted in rows, and a large rose-growing bed. When the Lakers divided two hectares off and built a retirement home on the east side, they sold to Reg and Elizabeth Finn who renovated the house and cottage, and upgraded the watering system. Planting many new trees, the Finns also created a park-like area on the garden’s north side. 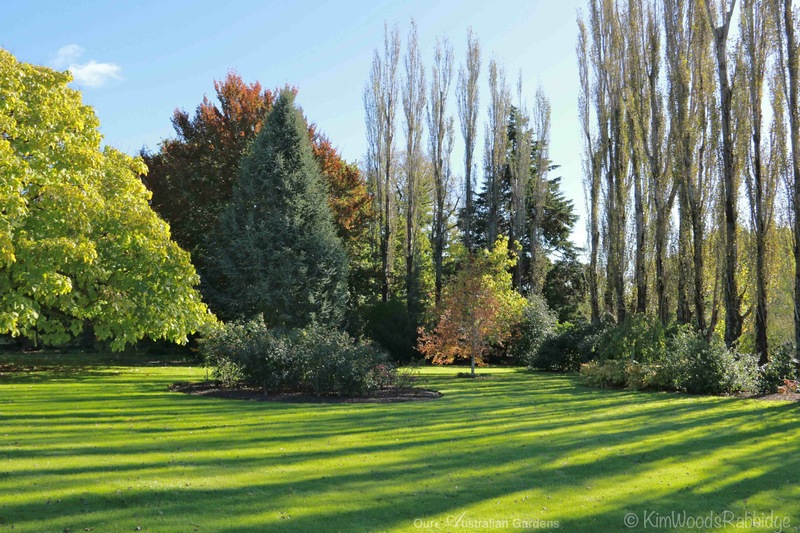 The property is edged on three sides with hawthorn hedges complemented with specimen trees of oak and conifers. One inoculated oak was moved from the previous garden in the hope of establishing truffles. As with any garden, renewal is a very important process and while several changes have already taken place at Culzean since Phillip and Dinah’s arrival, more are planned. Both Dinah, and trusted gardener Tim Pears, have introduced fresh ideas, while mindful of retaining the garden’s charming character. leads along to the magnificent India Bean tree Catalpa bignonioides. Large areas of open space provide a contrast with more intimate nooks. Pomes thrive in this climate. Quince, pears and apples, and apricots are abundant. Tasmania, The Apple Isle, has a well deserved reputation for being ‘clean and green’. Now their agriculture is quite diversified but for many years the state was a major supplier of apples to the world. In this garden mature trees provide protection from the extremes of the climate. Already temperatures have dropped below minus 1C with early frosts. The sandy loam has benefited from composting with the addition of leaf mulch from those same mature trees. Well-established drifts of Cyclamen persicum, some with tubers as big as a football, illuminate the floor beneath stately trees. A Scottish elm provides a picturesque setting for summer brides on ’The Weddng Lawn’. The large sculptural leaves of Gunnera, at the water’s edge, die down over winter. Tim has been establishing new areas, planting many herbaceous perennials, to ensure year-round interest in the garden. Crimson Sentry maples are effective ‘on duty’, and growing in a row. He’s currently working on either eradicating or reducing a few species that have become rampant such as periwinkle, Arum italicum, elderberry, blackberry, some of the lilies on the lake, and Iris pseudacorus on the water’s edge. Pink, white and yellow water lilies look wonderful in the summer but Tim’s keeping their numbers in check. Large areas of lawn have been over sown with exotic grasses for better performance. The property has no domestic stock but wild fallow deer visit – fortunately with minimal damage. Tim has found his true vocation in the garden with both metal work and green-keeping skills. He forged this bird bath for the owners’ previous garden, and both blue wrens and gold finches delight in the water. Sprawling limbs of this grand old oak shade a bench overlooking the croquet lawn. Camellia sasanquas, some up to five metres in height, bring welcome early winter colour. And crab apples, following on from spring’s shower of blooms, not only provide cheery autumn colour – they make delicious jam as well. Dinah’s just back from a visiting gardens in Europe – inevitably she’ll have further inspiration! We’ll look forward to visiting again and seeing what changes are made. It’s wonderful the new owners and gardener are all so passionate about Culzean. The legacy will continue to grow. We’d love to come and visit your cool-climate garden when you’re ready Michael. You made a great job of ‘Grandom’ in tough Mt Crosby conditions so I’m sure this new garden will be a dream.